I had a fantastic time at the conference – I really think this was the best year’s ever. 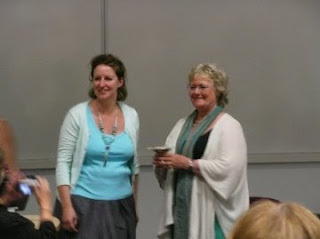 It was lovely to meet new friends (Jane, Susan, Lizzie, Tracey, Rachel) as well as old ones, and I came back fizzing. Sadly, I also came back to an intermittent broadband connection which ATE ALL MY EMAILS when it cut me off in the middle, so if anyone has emailed me about the conference notes and not had a reply, huge apologies but please email me again because I know 29 of my emails didn’t get through. My “secretary” decided to leave it until I got home and let me sort it out, sigh. Which means my guitar lesson has to be moved so I can see the engineer tomorrow (and possibly Dad's visit, too, sigh); and a meeting I was expecting to have today has to be moved but the other party is being a bit dilatory about setting times… and because I haven’t had much sleep for the last three nights I’m really not enjoying this morning!! Lovely DH gave me a lift to the station - reminded me of when I was a student and he'd give me a lift to the station on Sunday afternoon (especially as I was off to stay in student accommodation in Greenwich). Easy trip down - Tower Hill, then across the road (past the Roman wall) to the DLR. I was staying in Devonport House, which is next to the Maritime Museum. Natalie Rivers was already there, waiting for the key to the flats, so it was lovely to see a friendly face. 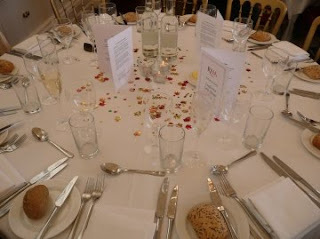 Then Sarah Morgan, Nicola Cornick, Heidi Rice and Abby Green arrived, so we were all set. 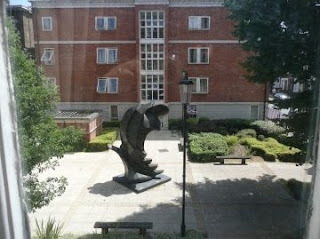 which overlooked the courtyard and a rather unusual sculpture. 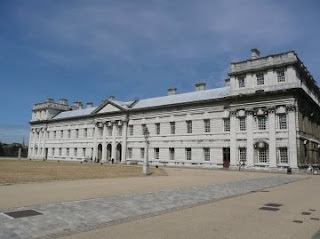 It was literally two minutes' walk from the centre of Greenwich, so it was very convenient. Walked down to the conference rooms, and the buildings were just MAGNIFICENT. Very glad that particular room had aircon! From there, it was back to change and glam up for the gala dinner. The food was great (pate, chicken in a really lovely sauce, Eton mess) - but I forgot to take pics of it because I was, um, too busy talking to glamorous fellow authors (lovely to see Cara, Elaine and Kate there - and to meet Lynne, who'd given me such a fab review for my sheikh book - as well as chatting to Natalie, Abby, Sarah and Heidi - who really does look like a film star here with Abby, and if she wasn't so nice you'd have to hate her for it. If you lot didn't already know I'm short and round, I'd hire her to pretend to be me...). 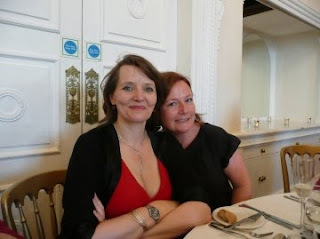 Saw my lovely editor, who gave me the very welcome news that my plans for next year are all fine, including deadline. 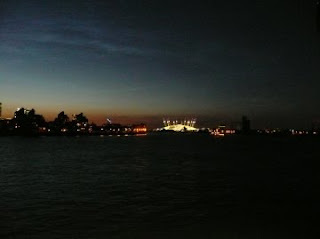 Diane Pearson, our president, made a very good speech: and then some of us found a nice cool spot on the balcony, overlooking London by night. Stunning views. Haha, it was lovely to see you too Kate, and I'd be more than happy to impersonate you, if you promise to do my next workshop for me... Your one on The Planner's Guide to Creativity was fantastic and has really got me thinking (and planning) always good for a complete pantser like me!! 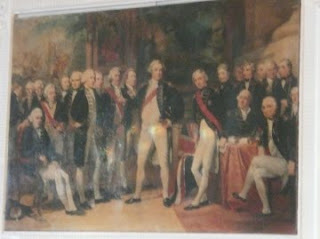 I think there was a definite reason those other guys in the painting were crossing their legs. 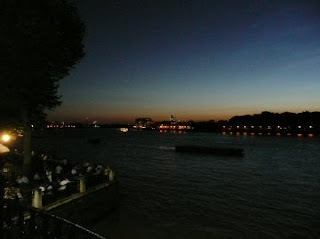 Luckily I did not have a mouthful of tea when I got to the end of this post Ms Hardy!!! It looks like you all had a lovely time. You've let me know that I missed a real good do! The accommodation, setting and in fact everything must have been really special. Thanks for sharing the pics. It all looks beautiful. Glad you all had such a wonderful time! Hope your day has improved considerably. 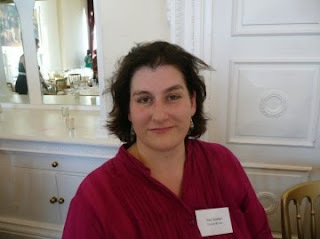 Lovely to meet you at the conference Kate and thanks for showing me the "shiny" ipad, I'm very jealous. Gorgeous pictures! It looks like so much fun! Caroline - thanks, it did, and we certainly had a great time! Heidi - LOL, that could be arranged ;) Glad the talk was helpful. Michelle - LOL, forgot to warn you there was a tea moment coming up! Great time but missed you. Margaret, it really was great. The setting was fantastic. 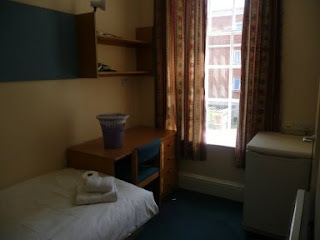 Accommodation - well, basic is fine, but we did have to ask if our kitchen could be cleaned as it had been left in quite a state (and let's just say the person who had my room before me had long dark hair and I had to clean my bathroom!). Not Jan and Roger's fault at all - they organised it brilliantly but were let down. Cara - was lovely to see you. It's the broadband rather than the PC that's the problem (she says, touching wood) and all is well now. Shirley - it was fabulous. And Ms Cohen always notices things like this. I've learned not to drink anything when she's talking because - well, that's why she's such a good writer. Great comic timing. Lacey - thanks - and it was HUGE fun! Have to add, 'Howe' - the big room - was my favourite -- because of the aircon. Seems like such a small thing most of the time in England, but when you suddenly find yourself in the middle of a heatwave, aircon becomes the most important thing in life. Along with sleeveless tops and access to ice-cold drinks! Glad I didn't spot that naughty light effect on the painting. Might have choked on my chicken liver parfait.